San Diego Comic-Con starts (unofficially) Wednesday and those who don’t have a badge may feel like the person at a club stuck outside behind the velvet rope. But really things really are much better in Comic Con’s case. Comic Con has become so all encompassing that it influences what goes on around its home, the San Diego Convention Center. Many of the events it spawned don’t need a badge and sometimes a big Comic Con player puts on a show outside for every fan who comes to the Gaslamp. Offsite, but Con-inspired events are set for areas from downtown to the Embarcadero to Balboa Park to Liberty Station and all the way up to La Jolla. Will Godzilla look so fierce behind the San Diego Convention Center at Comic-Con? 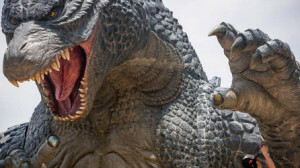 Photo credit: @GodzillaMovie via Twitter. Godzilla: The movie may have come out in May, but evidently the old grumpy beast is hungry for some San Diego. A display of Batmobiles was in the area between the convention center and Hilton Bayfront a couple of years ago. This year, fans of the big lizard can find a Godzilla exhibit off the same area, but all the way behind the convention center, where the Hall H line usually stretches. Don’t let him swat you! Plaza at 5th below Harbor Boulevard: NBC will promote several of its shows, including Constantine, Grimm and Hannibal, in the area where the Tin Fish restaurant and public fountain are located. There will be giveaways, some of them promised to be limited editions, and “a 3D experience” involving Constantine. HBO pop-up shops/MAC store: For those who opt to shop, HBO will bring two containers full of Game of Thrones and True Blood merch, on Market Street and 8th. The temporary shops will be open each day of Comic Con. Also, if you’ve ever watched The Simpsons and thought, “Gee, I’d really like to rock Marge’s look today,” MAC Cosmetics will have the collection inspired by the character, pre-release, Saturday only at its store at 234 5th. Would you line up for a Marge makeover? Gotham: The city looks pretty scary in the films, comics and cartoons, and it will be recreated in San Diego for all of Comic-Con on the south side of the convention center. It’s a promotion for the new Fox series Gotham, a fresh take on the Batman mythology. Better yet, Fox will host zip-lining from the convention center to the Hilton 130 feet across the way. Will all those who take the ride be as stoic as Batman? We think not – there should be a lot of screaming going on. So even if you’re zipless, there will be a show. People watching: Think we’re kidding? From just showing up on the steps to watch the costumed humanity flow in – how many bikini-clad Princess Leias can you spot by noon? – to going to the plaza south of the convention center to see how far the Hall H line stretches (or who’s hosting a special party on the huge yachts lined up in back), there is so much to experience without picking any one particular venue. And really, the good watching isn’t just at the center. There will be something to see roughly from the area bounded by Market to the north, Front to the west, Petco Park to the east and the center on the water. Just wandering and enjoying is most exquisitely free.